The Federal Government plans to issue two bonds valued at N100 billion next week, in a continuation of the government’s dual strategy of proactive debt management and development of the domestic debt market. A notice by the Debt Management Office (DMO)-which oversees Federal Government’s sovereign debt issues, indicated that the government will be offering by subscription N100 billion worth of bonds in its February 21, 2018 auction. The offer circular obtained yesterday indicated that government will sell a N50 billion three-year bond at a coupon of 14.50 per cent and maturity of July 2021. Government will also offer a N50 billion bond with maturity in February 2028. The July 2021 bond is a re-opening of previous issues while the February 2021 bond is a new 10-year issue. Nigeria’s economy is still vulnerable with fragile growth driven by increased oil production and rising crude oil Price. Chief Executive Officer, RTC Advisory Services Limited, Mr. Opeyemi Agbaje made this observation at a media parley in Abuja. He noted that, while there was miraculous reversal in oil price and production out put, other sectors such as manufacturing, services sector, telecommunications are yet to come out of the recession. According to him, “unless we reverse our budget culture, poverty will continue to grow. When you spend 80% of revenue on limited number of people you will get the sort of outcome we are currently grappling with. Unless you reverse the trend of your priority by spending 80% on capital projects and spend less on recurrent items, there would be massive poverty” he said. The Chairman of the Commonwealth Enterprise and Investment Council (CWEIC), Lord Marland of Odstock, has said it was time for the UK to set up a post-Brexit trading zone, with Nigeria, Singapore and Malaysia offering major opportunities. Lord Marland added that leaving the EU’s customs union was one of the UK’s “great negotiating strengths,” as it would grant the freedom to stimulate trade by lowering tariffs and other trade barriers. The benefits of doing so would extend beyond the Commonwealth, he said, as a potential free trade deal with Japan was already “worrying” German car manufacturers who rely on exports to the UK. 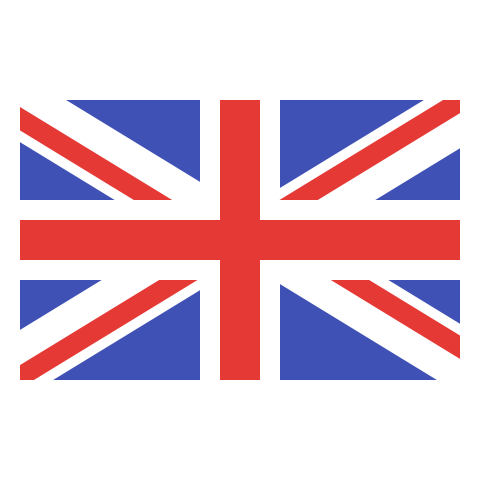 Britain is Nigeria’s second-largest trading partner, after South Africa, with the bilateral relationship worth around £3.8billion per year. With the Commonwealth’s cumulative population standing at 2.4 billion, the combined Gross Domestic Product of the nations is set to reach US$14 trillion by 2020. Intra-Commonwealth trade, which was estimated to be worth $525 billion in 2015, is projected to surpass $1 trillion by 2020. CWEIC’s ambition is to encourage and grow intra-Commonwealth trade and investment, and assist member organisations in developing high quality trade and investment opportunities. The past week’s financial-market turbulence is keeping foreign-exchange traders busy, boosting volumes along with volatility. Price swings in the $5.1-trillion a day currency market have jumped at the start of 2018 to the highest since November 2016 on a monthly basis, according to a JPMorgan Chase & Co. gauge. The turmoil coincides with surging trading activity, say JPMorgan and CLS Group Holdings AG, which settles global foreign-exchange transactions. As heads of currency trading from the world’s biggest asset managers and banks gather at the TradeTech FX conference in Miami this week, they’re fixated on whether the turmoil will persist. If it does, it could be a boon for speculators, while complicating the tasks of hedgers who prefer more placid waters. “Volatility is natural to markets -- low volatility is not natural,” said Isaac Lieberman, chief executive officer of Aston Capital Management LLC in New York. Market gyrations have returned to FX after a subdued 2017, which was the calmest year since 2012, according to the JPMorgan gauge. As other central banks look to follow the Federal Reserve in withdrawing monetary accommodation against a backdrop of strengthening global growth, there are plenty of catalysts that could whipsaw markets. “Market activity is really taking off,” said David Puth, chief executive officer of CLS Group. CLS settled an average of almost $2.1 trillion of currency trades a day from Monday to Thursday last week, up 14 percent from January’s average, the company said in a statement. As markets became more volatile over the last two months, JPMorgan’s clients boosted their use of the bank’s currency algorithms, according to Richard James, co-head of macro markets execution in London. The number of users trading on the bank’s electronic platform also grew, with every day last week exceeding the highest level seen in 2017. 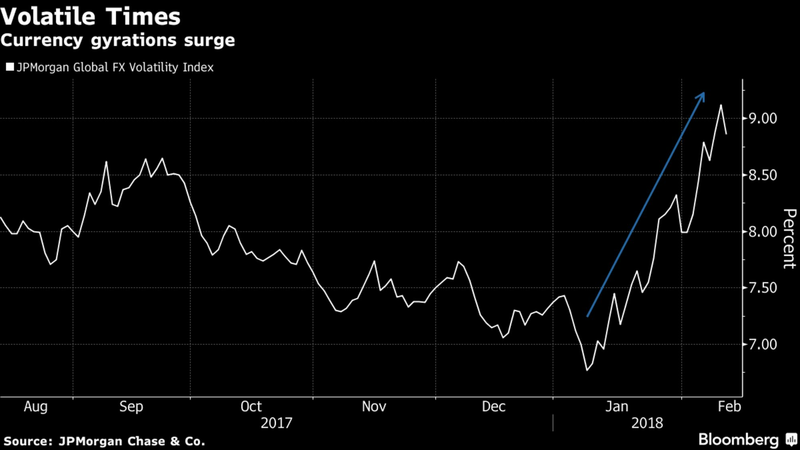 “What we’re seeing right now is the start of the volatility -- I think that continues,” said Lee Ferridge, head of macro strategy for North America at State Street Global Markets. If the turbulence persists, it could prompt the Fed to back off its tightening cycle, he said. U.S. regulators are keeping a keen eye on liquidity in the world’s largest financial market. The ability to buy and sell currencies when needed has been a focus for participants in the $5.1 trillion-a-day market amid stricter regulation and increased electronic trading. Declining liquidity has been blamed for flash crashes in foreign-exchange markets, including the British pound’s plunge in October 2016. Ensuring liquidity is a key priority for asset managers and hedge funds seeking to execute currency transactions, while Bank of America Merrill Lynch has noted that reduced activity is spurring a battle for market share among dealers. A survey published last year by the organizers of the Miami conference noted that finding alternative methods to source liquidity was among the biggest priorities for many currency trading desks. CAIRO, Feb 14 (Reuters) - Egypt’s GDP growth for the second quarter of the 2017/18 fiscal year rose to around 5.3 percent from 3.8 percent in the same period last year, Planning Minister Hala al-Saeed said on Wednesday. JOHANNESBURG, Feb 14 (Reuters) - South Africa’s rand jumped more than 1 percent to its firmest since June 2015 and bonds hit a one-week best on Wednesday after the ruling African National Congress (ANC) said it would proceed with a vote to remove President Jacob Zuma from office. At 1140 GMT the rand was 1.1 percent firmer at 11.8200 per dollar. It earlier rallied to a session best 11.7975 just after the ANC’s parliamentary caucus said it would support a motion of no-confidence brought by an opposition party against Zuma and due to be heard in the house on Thursday. The party’s chief whip Jackson Mthembu said the ANC hoped to elect party leader Cyril Ramaphosa as president of the country on Thursday, after the no-confidence vote, or on Friday, accelerating the end of Zuma’s scandal-plagued reign. “We saw the rand strengthen about 10 cents on the announcement but the fear is it’s still not a done deal, so that’s why we’ve seen the rand bounce. Zuma could still have something up his sleeve,” Tradition Futures derivatives trader Gillian van Heerden said. The rand’s fortunes have been closely tied to political outcomes over the past couple of years, with the impasse in the last few weeks over Zuma’s future weighing on the currency’s 2018 rally. The cost of insurance on the rand also rose sharply, with the price of one-week options increasing nearly 30 percent. Bonds also firmed, with the yield on the benchmark 2026 paper down 6 basis points at 8.395 percent. 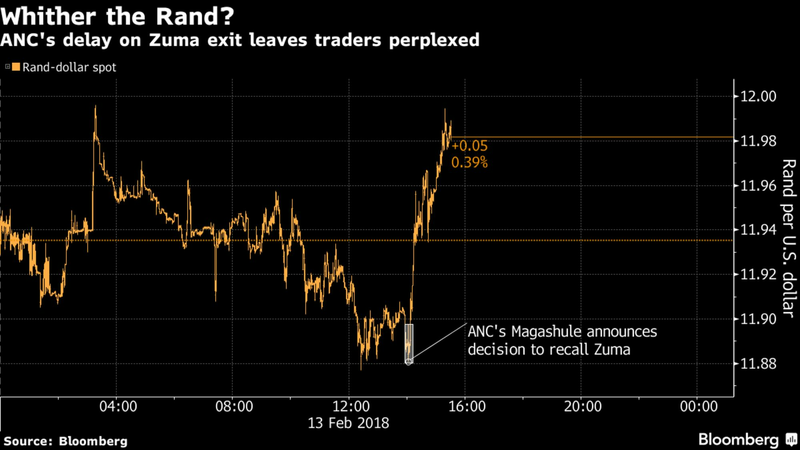 For about five minutes, the world’s most volatile currency barely budged as a top leader of South Africa’s ruling party made the announcement that everybody had been waiting for: President Jacob Zuma has been ordered to resign. Then the rand started giving up the day’s gain as traders digested the statement read by African National Congress Secretary-General Ace Magashule: the party hasn’t given Zuma a deadline to comply, leaving the country’s leadership crisis unresolved and investors unsure about prospects for the currency. Cyril Ramaphosa, leader of the ANC and Zuma’s designated successor, is still waiting in the wings. Unless Zuma decides to resign soon, the ANC may have to order its lawmakers in parliament to approve a motion of no confidence in the president. The political impasse already forced the unprecedented postponement of last week’s scheduled annual state-of-the-nation address and may imperil the presentation of the budget next week, with Moody’s Investors Service poised to cut the country’s local-currency credit rating to junk. 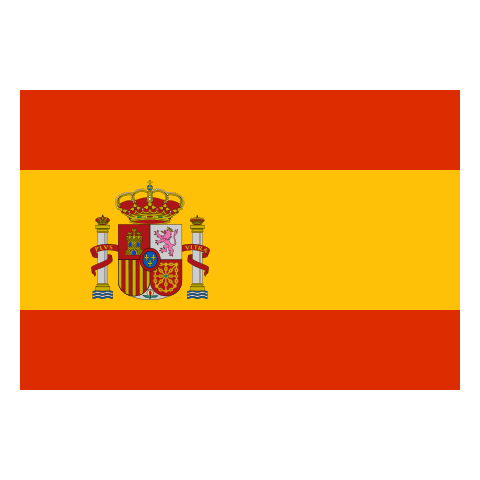 That would spark the exit of the country’s bonds from Citigroup Inc.’s World Government Bond Index, resulting in capital outflows as funds that track the gauge are forced to sell, and pressure on the currency. The rand weakened 0.4 percent to 11.9841 per dollar by 3:45 p.m. in Johannesburg, paring its advance in the past three months to 21 percent. The African National Congress will replace Jacob Zuma as president of South Africa. “As much as there is mild disappointment in the market as this news has broken, the market is taking the big picture as positive for South Africa, while Ramaphosa is strengthening his grip over the ANC, and Zuma looks like he’s hanging on for dear life. He’s probably only managed to buy a little bit of time. This hasn’t changed our view of South African assets.